On Tuesday night, Showtime will air Stephen Colbert's Live Election Night Democracy's Series Finale: Who's Going To Clean Up This Sh*t? at 11 p.m. EST. But, what if you miss it or forget to DVR it? 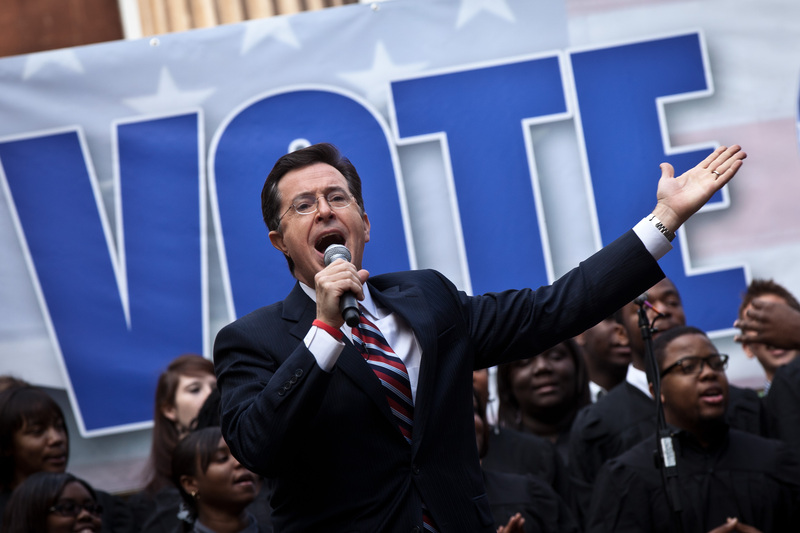 Will Stephen Colbert's election special replay after election night? Basically, it's the gift that keeps on giving, because it certainly will air again — and more than once. Colbert and Showtime obviously want you to be able to watch what will most likely be a glorious election special multiple times. As of Tuesday, Nov. 8, Showtime's schedule shows that the late-night talk show host's special is schedule to air two times after it's original airing at 11 p.m. EST. For Showtime subscribers, they can catch it again at 12 a.m. EST on Wednesday, Nov. 9. Also, if you have Showtime 2, you can watch it at 1 a.m. EST, also on Wednesday. If you find yourself just too tired to watch it after the United States declares it's next POTUS, don't fret, because Colbert's special is also on Showtime's schedule five more times. It will air Wednesday, Nov. 9 at 10 a.m. EST on Showtime Showcase and 10 p.m. EST on Showtime 2. On Thursday, Nov. 10 it will air at 9 p.m. EST on Showtime. Finally, you can watch it again (let's face it, you know you want to), on Saturday, Nov. 12 at 1:10 a.m. EST on Showtime and at 3 p.m. EST on Showtime 2. With all of those replays of the comedian's election special, you certainly can't complain that you missed it or that Showtime didn't give you more than one opportunity to enjoy it. If I were you, I'd make sure my DVR was set to record at least one of the airings.